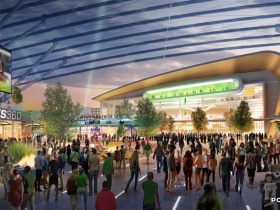 The Milwaukee Bucks and their design team are not only planning a brand new arena, but also a brand new, year-round entertainment district in the area where the BMO Harris Bradley Center is now located according to area renderings. 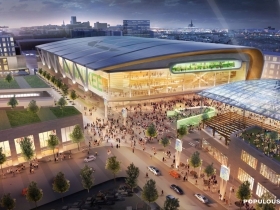 The plans include a new arena, a 60,000 square foot public plaza, a new parking facility and a new practice facility. The plaza could feature bars, restaurants, a water wall, outdoor fire pits and could include a connection (some day) to the streetcar. 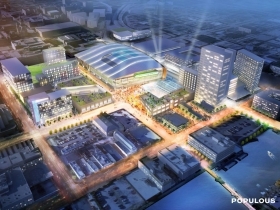 The Bucks owners have also talked about potentially building a hotel and office or residential development, but have released no detailed plans for this. The proposed arena would be located between W. Juneau Ave, N. 4th St., W. Highland Ave. and N. 6th St. 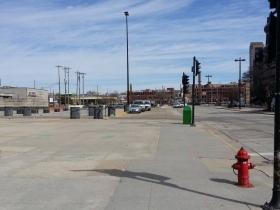 In addition, an entertainment complex would be built in the footprint of what is now the city’s 4th and Highland Parking Garage, a large, brown forgettable structure. 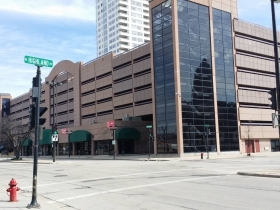 The current BMO Harris Bradley Center would be torn down and the entire site would be redeveloped between W. Highland Ave., N. 4th St., W. State St. and N. 6th St.
Any auxiliary development that happens would go primarily in Park East land that is border by W. McKinley Ave., N. Old World Third St., W. Juneau Ave. and N. 6th St. The three vacant plots of land along W. Juneau Ave. are now vast stretches of grass and leftover concrete, with a population consisting of a few seagulls. 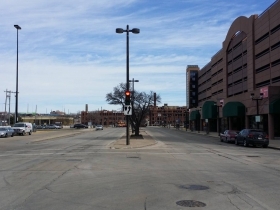 The block containing Turner Hall and its parking lots, the buildings along Old World 3rd Street, anything south of W. State Street, anything north of W. McKinley Ave. and anything east of N. 6th St. (including Milwaukee Area Technical College) will remain unchanged. Our photos show what the area looks like now and renderings for the proposed development show how the area will change. I’m still waiting for every business owner outside that blue perimeter to cry foul and fight anything beyond the building that the games will be played in. Are everyone’s memories so short that they forget the proposed “investment” from the state/county/city is even worse than the TIFs proposed for “The Brewery” makeover of the Pabst property oh-so-not-long-ago? The secrecy over the actual plans for this thing and the attached “entertainment district” are even more maddening that building the arena in the first place. I read comments like Richs and just shake my head and wonder if he is joking. Anytime there is a billion dollar project and the opposition is screaming about one hundred dollar fire pits, you know they are simply grasping at straws. That’s great! It just better not all be exempt from property tax. The Bucks are important to the City but not important enough to forgo all future property tax revenue from that entire area. Though secretive about details, the Bucks prez (Feigin) has said they want to be as “opportunistic” as possible with as as big a footprint as they can get. More ways to get their revenue-share skim. 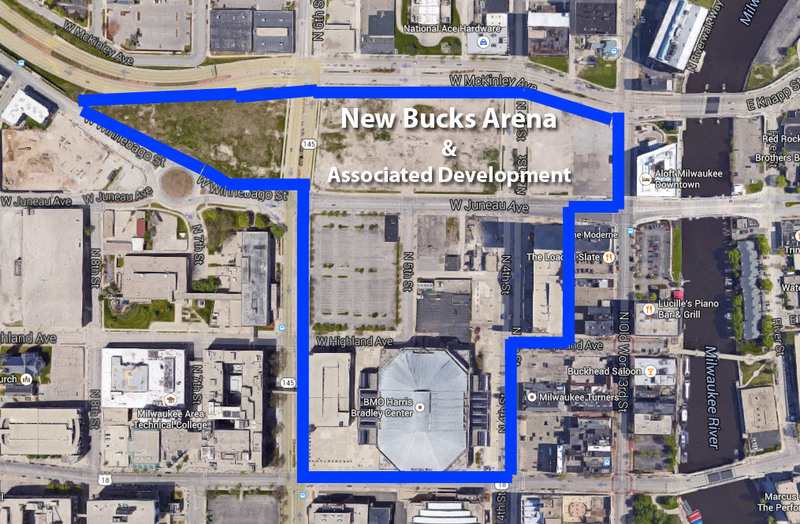 Bruce M.’s report shows how the state’s plan could make every bit of “ancillary arena development” part of the state-owned “Arena District.” That includes the entire entertainment complex, a practice facility, you name it (w/ or w/o trendy fire pits). While more sports bars/nightclubs could be fun for some, why should a state-owned entity build and run them? 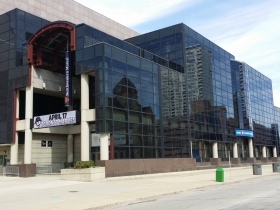 Even with a completely donated arena, the Bradley Center is now $20 M in the hole. State has pumped $10M into BC in past 5 years, and has zeroed out funding for state parks, slashing UW budgets, etc. If arenas are money pits, a nightclub district will be a money sinkhole (and eventual white elephant). I say let Free Market Capitalism build nightlife districts! Do we know if the developments outside of the actual arena are going to be tax exempt? Are we sure that everything inside the “Sports Entertainment District” is tax free? David, that sounds like a Q for Don Walker of the JS? City officials have said they can’t do much of a TIF because there won’t be any way to collect property taxes on any of this. It sounds like they hope there might be some private development on the far fringes, or if BC site is redeveloped. 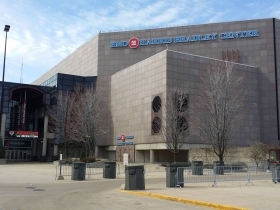 Bradley Center may someday be razed, but not as part of this plan. Someone will have to pay demo costs. That sq. block includes BC’s existing parking structure. Tearing that down will mean building another garage. Another huge cost. I’m a basketball fanatic, long time bucks fan, and honestly I would rather that these carpetbaggers move the team then squeeze all this money out of the city. 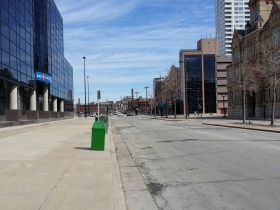 WOW, the Bucks owners want this city/county/state to lay out all this money for them to build this playgound then they turn around and say they eventually want to build a hotel,residential,business area on top of this? We then get to pay for that too because you know this mayor & county exec with give them the key to the city and the “free” tax rolls. If they have all this money to “build” this city, let them pay for their own playground instead of us who will never use these facilities. The Bradley Center cost $90 million and was fully donated by the Bradley Family. The project received free land and some infrastructure support, and the city built the parking/commercial structure on 4th Street between Juneau and Highland for about $25 million, at the donor’s request, to help provide sufficient parking. The arena was then donated to the state to manage. Just plain corporate welfare. See the article in Sunday’s MJS about the Kansas city arena that eats up $15million in taxpayers money every year because the project is not self supporting. Let the Bucks move out of Milwaukee. If this is built, I see a lot of politicians loosing their jobs. People are adamantly against it throughout the state. The jock tax they will be using will be taking more money out of the general fund from schools, transportation, the university system, the elderly and disabled.